What made you decide to sign with Iona? After all the visits and conversations with coaches it seemed like the best fit athletically and academically. God definitely orchestrated some things the last few months that added to the feeling that Iona was where He was leading me to go. Definitely a lot of prayer and many discussions with my parents and coaches on the pros and cons of the schools I was considering. I was surrounded by some excellent runners and coaches that showcased their respective programs, and ran with most of the teams I did officials with. I got a feel for what everyday life was a college athlete at each school. I took official visits at Northern Arizona, Furman, and Iona and took unofficial visits at Lipscomb and Liberty. I first started running the summer of seventh grade to try to get into shape to try out for JV lacrosse the next spring but ended up loving running and really enjoying the tight knit team at Dorman. My biggest challenges have been the stress fracture in my femur last cross country season and the knee injury I sustained at track state qualifiers my freshman year. I learned to do all the little things that lead to improvement and to trust less in myself and more in God's plan for me. How is training now that the season is over? My training since my break from cross country has been great, definitely feeling strong and excited for the upcoming season. 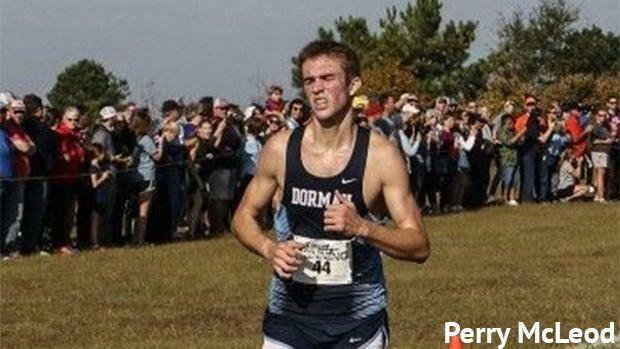 How do you look at your time at Dorman? It's been incredible, I've had amazing coaches there including: Coach Buys through all 6 years of cross country, and Coach Urban the last three years of my track, and Coach Johns the head coach of track the last five years of track who all have contributed a lot to my success. I couldn't have asked for better teammates while at Dorman, and have only received encouragement from the administrators and AD. I'll definitely miss being close to my friends and family. In terms of the team, I couldn't have asked for a better season. In terms of individually I was very blessed to win 5A state but was incredibly disappointed with how the post season concluded, it's been a big motivator to give my best every day on my runs this winter. By far the biggest was winning state as a team last year in track and this year in cross country, I would trade all the individual accomplishments if it meant sharing those moments with my teammates. I hope to study business (not dead set on a major at the moment) and meet people in the professional world that can help me pursue a job after college. It feels great to not have the weight on me and to be able to focus on my training. It would be difficult to race my best without my entire focus being on the race. How did the Iona coaches react when informed? They were very excited when I called them and I also received several messages from some of my future teammates that I'd kept in touch with this fall.